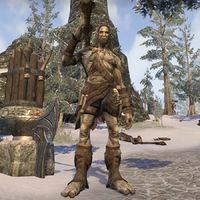 Giants are large primitive humanoids most often found in Skyrim. They are also often accompanied by mammoths. As they are considered elite enemies, giants are immune to all forms of crowd control effects. The giant swings its club, sending three shockwaves along the ground in front of him. This attack does moderate physical damage to all enemies hit by it. 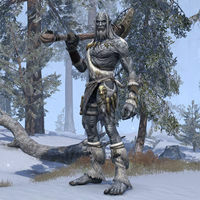 The giant smashes the ground with its club, doing high physical damage as well as stunning all enemies as indicated by a red cone. This page was last modified on 22 April 2019, at 15:11.